The largest island in the Med and home to the largest active volcano in Europe, Mt Etna, Sicily finds itself at the crossroads of many ancient civilisations. This melting pot of classical influences has shaped its unique character today. Its rich culture, coupled with breathtaking natural wonders, makes for an idyllic setting. In 2019, we’re taking cyclists on an 8-day tour of the lesser-travelled eastern corner of Sicily. At an easy-going pace, you’ll explore ancient Greek and Roman sites, vibrant towns, Baroque and more Baroque, as well as pristine coastline and beaches. Sicilian food is known in Italy to be some of its richest in terms of flavours, herbs and essences. Rest assured, you’ll be enjoying lots of it and putting that reputation to the test. Riding through East Sicily’s landscapes feels like you’re pedalling back in time to the Sicily of black and white movies, where your cycling fits in with the slow and quiet mood of the area – taking in the aromas of the Mediterranean as you ride. You’ll journey over picture-perfect plateaux, through secluded valleys and along sparkling coastlines, scattered with country villas and open landscapes of stone walls, olive groves and fields of citrus fruits. When it comes to the architecture, we promise you don’t have to be a lover of Baroque (although don’t get us wrong, there is plenty of it!). You’ll head from Palazzolo Acreide to Siracusa, via Modica, Ragusa and Noto, to gaze at the plethora of famous and fascinating buildings and monuments, many of which are UNESCO World Heritage sites. Due to its location, set between Europe, Africa and the Middle East, Sicily has played a strategic game throughout its dramatic history. Having been occupied by every major civilisation from the Phoenicians, to the Greeks, to the Romans, to the Arabs and even the Normans; everything about Sicily reflects this rich blend of culture with its vibrant, expressive and strong Sicilian way of life that must be experienced. As German writer Goethe said in 1787: “To have seen Italy without having seen Sicily is not to have seen Italy at all,” and we could not agree more. Our tour begins in the charming, ancient town of Palazzolo Acreide. You’ll arrive and get settled, before discussing the week ahead with our local representative and fuelling up with your first taster of amazing Sicilian food. There’ll be time to explore Palazzolo Acreide on foot the next day, its Basilicas of San Paolo and San Sebastiano are unmissable UNESCO World Heritage sites. Once you pick your jaw off the floor, you’ll say ciao to Acreide and cycle on to the Greek ruins of Akrai. Take in its famous Greek theatre and the Temple of Aphrodite, before pedalling through the lush Hyblaean territory towards Modica, your home for the night. With energy levels topped up, your route on day 3 is a downhill stretch to Scicli, with even more architectural and cultural treasures, such as the enchanting Saint Bartholomew’s Church, looking out on a rocky landscape of ever-changing colours. From here you’ll sense the sea air as you head to the coast to Pozallo, a town famed for its clean beaches and crystal-clear water – the perfect end to a day’s cycling. In Pozallo, halfway through the tour, you’ll roll along the Mediterranean coastal road to Capo Passero. Along the way, soaking up the turquoise sea, until you reach the Isola della Correnti; Italy’s most southern point that’s considered to have one of the most beautiful beaches in Sicily. After sampling some delicious Sicilian wine, Vino d’Avola, in one of the many wine cellars the night before you’ll cycle north today through the untouched Vendicari Natural Oasis, an area of historical and scientific significance, that’s bursting with flora and fauna. Here, you’ll leave your bikes to discover the astonishing remains of the Byzantine village on foot. 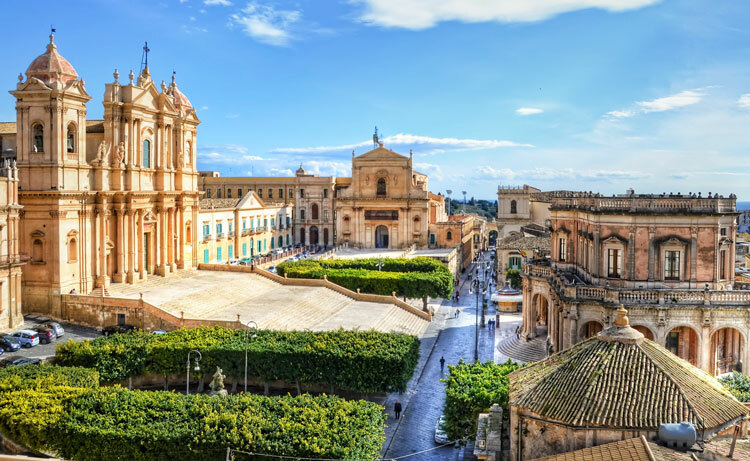 From the Citadella dei Maccari you’ll go to Noto, the Baroque capital city. Expect a heady mix of opulent palaces and churches, juxtaposed with cosy courtyards and be sure to wander the town in the evening, stopping for some delicious Sicilian gelato or cannoli. The following day, day 6 of the tour, you’ll embark on your final day in the saddle. 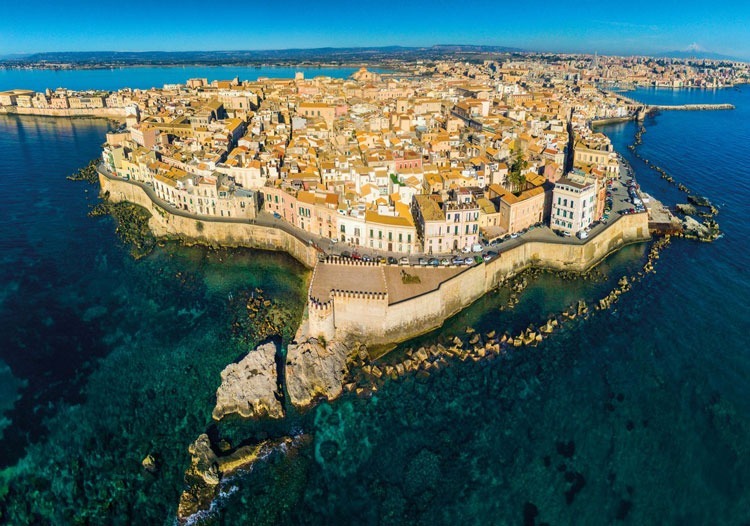 Meandering through cultivated orange groves and olive trees, for some authentic Sicilian scents, before arriving at your final stop, Siracusa, the capital of Magna Grecia. Day 7 offers up a rest day, so all that’s left to do is lose yourself in the enchanting streets and promenades. A dreamy ending to a dazzling tour. It’s a time to reflect on the week’s wonders and if you want more, head straight to the Temple of Apollo, the Duomo and the Foundation of Arethusa. The Ortigia market is great for some last-minute gift buying and to soak up the atmosphere of real Italy. You won’t want to leave – we didn’t. The main use of rice in Sicily is not in risotto but in arancini – rice balls that are a staple snack food across the island. In the south east of Sicily, arancini is often filled with ragu, peas and mozzarella. Another street food dish is pizza, but what makes ‘Sfincione’ different from Italian pizza is its thick base. The standard toppings are anchovies, onions and of course, mozzarella. Typical of East Sicily, this dish is a combination of aubergine, tomato sauce and salted ricotta, served with short pasta. Its name comes from Norma, an opera written by Bellini. Every type of Caponata has a different recipe using seasonal vegetables, that said, cooked aubergines are always at the base. It is sweet and sour, and served in a tomato sauce. 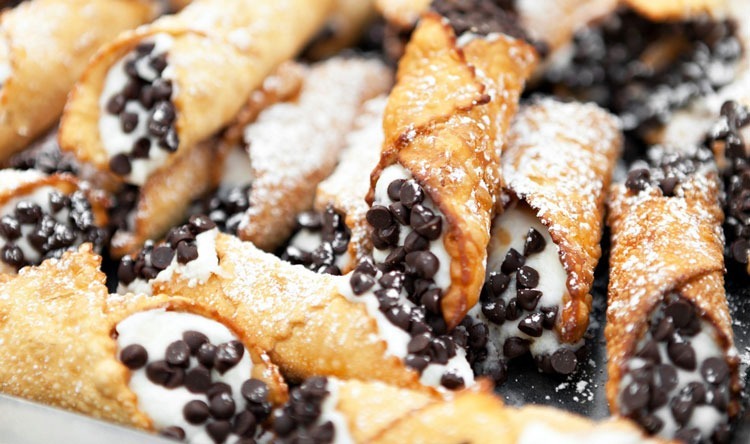 The most famous of Sicilian sweet treats: a tube of fried dough filled with sweetened ricotta that’s topped off with candied fruit, pistachios or chocolate chips. Feeling inspired? 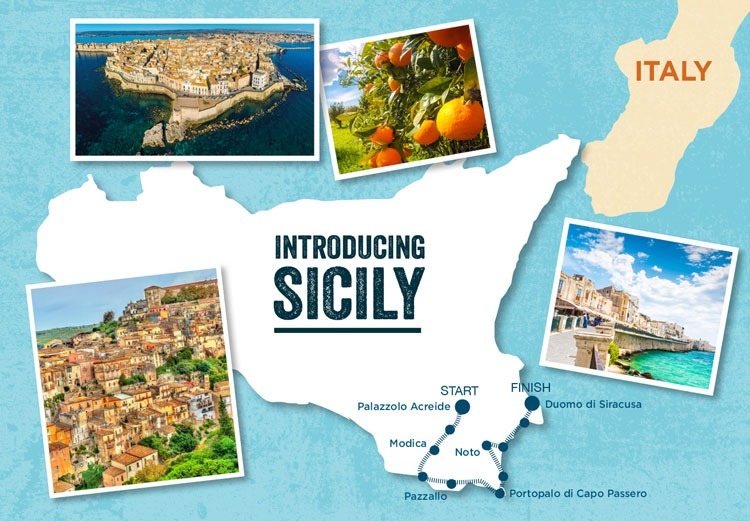 Sicily is now officially part of our range for 2019. Visit our website and download the trip notes to find out everything you need to know about our new trip for leisure cyclists.